Image from Dwell. Architect Barbara Hill. Photography by Dean Kaufman. Found thanks to Erin Loechner Pinterest via One Pool Road. I just love this industrial look. Love the books! 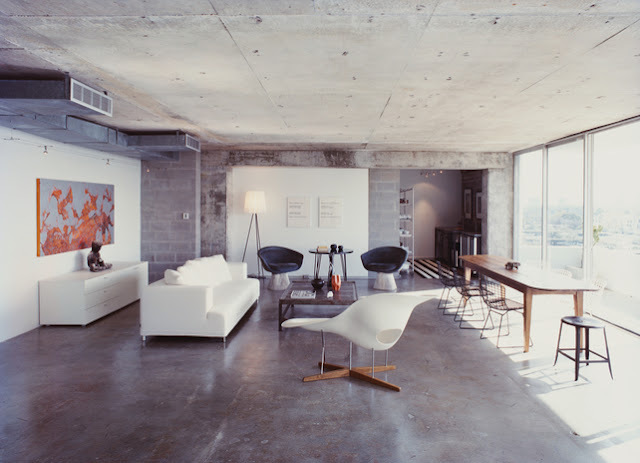 Love the concrete floors... if they are heated. Love every piece of furniture and every object, but... where's the rest of her stuff??? How can anyone have so little stuff? I love the minimalist look but can't understand how anyone can fail to amass more stuff than this. You have your own design. Like it. Thanks for sharing. Bright open feel and I like the modern furniture mixed with the industrial look and feel of the place. The exposed walls always look great too thanks for these pics!